Across the Harbour, whether by the Sydney Harbour Bridge by Ferry from Circular Quay, brings you to the Northern Beaches, starting with at Manly. The area stretches all the way north to Palm Beach. Other Beaches located in the North of Sydney include Whale Beach, Avalon Beach, Bilgola Beach, Newport Beach, Bungan Beach, Mona Vale Beach, Warriewood Beach, Turimetta Beach, Narrabeen Beach, Collaroy Beach, Dee Why Beach, Curl Curl Beach, and Freshwater Beach. All with their own charms and attractions. At Manly Pier, or Manly Wharf as the locals like to call it, there is an tourist information office. Drop in to find out more about the many beaches in the Sydney northern suburbs, tours, Manly restaurants and dining - some great restaurants here, things to do for kids and entertainment. There are festivals and events at different times throughout the year. Manly is very much a beachside suburb, having both beaches on Sydney Harbour and the Ocean. You can get here by bus, ferry and jetcat from the city, from there it is a short walk to the beachfront. The ferry ride across the harbour itself remains an iconic Sydney experience. Avalon Beach has surf and body surfing (often called body bashing in Australia) as well as swimming and good fishing. The beach is bordered by 60m high sandstone cliffs. Has a pool on the south end. Tucked below Bilgola Bends, Bilgola Beach is about 500m long. Fringed by palm trees it can be very tranquil on an early weekday morning. Has a surf club and a rock pool, good for families. Bus 190, Wynyard in the city, or the 191 from Newport. Collaroy Beach is easy to get to, popular and the longest beach on the Sydney north shore, adjoining Narrabeen Beach. Has ocean pool and a Surf Club. While there, surfers and others may wish to check out the Surf Rock Hotel, with it’s excellent collection of surf memorabilia. The beach is near Collaroy shops for various eateries and the Collaroy Cinema. Close to Long Reef Golf Course and the Narrabeen Lakes, for sailing and canoeing. Named after a shipwreck with the name ‘Collaroy’. Pittwater Road. To get to Collaroy Beach, take Bus 182 or 190 from Wynyard in the city, or the 155 or 157 from Manly. Both Clareville beach and Paradise beach are on the Pittwater. There are BBQ facilities and picnic tables available. Sailing, windsurfing, and canoeing are popular water sports here. Getting There: Bus 190 from Wynyard in the city. Curl Curl Beach has both North and South beaches. This beach can get rough with strong currents, but there are two clubs on each end of the long beach, so there are lifeguards on summer weekends and public holidays. Good for board and body surfing, but beware of rips. There is a nature walk beginning at the north end. To get to Curl Curl Beach, take Bus 139 from Manly Wharf. Named by James Meehan in 1814, Dee Why Beach has been long a favourite with surfers but can also be enjoyed by the rest of the family. Scenic, it stretches for almost 2km up to Long Reef beach and the golf course. Rock pool, surf club and park with picnic tables. Dee Why beach shops, eateries and restaurants with local and international fare. Getting There: Wynyard bus 177, Manly 136 or 157. Freshwater Beach is a great beach for body surfing, tucked between Queenscliff Beach and Curl Curl Beach. Has surf club, change facilities and beach showers, as well as a park and picnic tables. Shopping centre with eateries and restaurants nearby. Getting there - Bus 139 from Manly. You can also walk from the north end of Manly Beach over the Queenscliff headland. There are stairs and is about 10 mins walk, yet the views alone along the promenade in Manly and from the headland make it worthwhile. 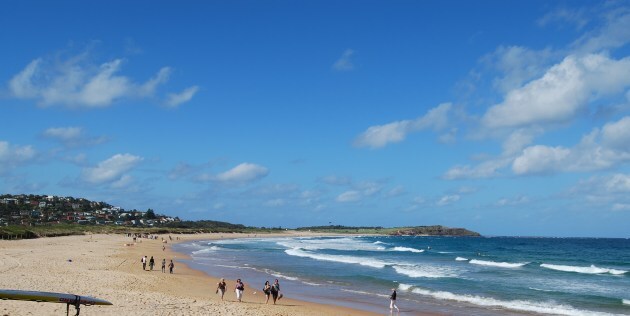 Long Reef Beach is located at the North end of the beach stretching from Dee Why. Next to Long Reef Golf Course and backed by a wild life refuge and lagoon. Swim between the flags, as there are strong currents there sometime. The surf can get quite good for surfers and body bashing (aussie for body surfing). Known for absailing from the cliffs, windsurfing and kite surfing during winter. Getting There: Manly Bus 136 or 157. 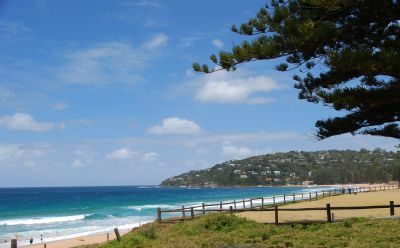 Palm Beach, a beautiful scenic beach located at the north tip of the Sydney Northern Beaches Peninsula. There is a surf club on the south end of the beach and a rock pool, while the North Palm Beach surf club is situated about half way up the beach further north. Barranjoey Lighthouse is a 20-30 minute walk away, offering grand views of the Hawkesbury River outlet to the ocean, Broken Bay and the Pittwater. The historic lighthouse, situated on Barranjoey Head is surrounded by an Aquatic Reserve while Barranjoey Head is part of the Ku-Ring-Gai Chase National Park. 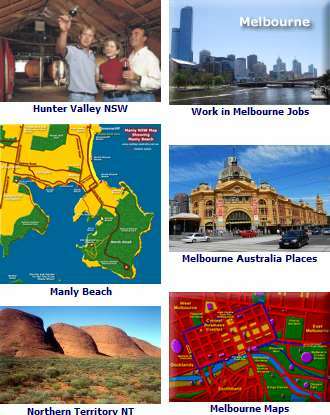 Map shows beaches from Manly Beach to Palm Beach - See Northern Beaches Map. Also shows Whale Beach, Avalon Beach, Bilgola Beach, Newport Beach, Bungan Beach, Mona Vale Beach, Warriewood Beach, Turimetta Beach, Narrabeen Beach, Collaroy Beach, Dee Why Beach, Curl Curl Beach and Freshwater Beach.